Harley Davidson EVO SOFTAIL Granucci gel seat, Ultra sleek, yet comfortable. Looks like a solo, but can carry a pillion for short journeys. Upholstered in black synthetic leather, finished with a white stitched detail on inner saddle area. For a sleek, cool, low profile appearance, take a look at Granucci gel seats. These amazing seats not only add style and class to your cruiser, they are robust and comfortable. Fashion and function unite to produce some truly exquisite seats that are easy on the eye, and on the pocket. The long seat models are one piece saddles, that could take a pillion on short journeys, but look to all intents, like sleek solo seats. Other two piece solo and pillion seat styles are also available . How does a great looking seat like this feel so comfortable and stand up to the rigours or wear and weather?. Granucci's first principle is to make a seat that fits each bike model without any further modification. Seat construction is from the best materials without compromise. 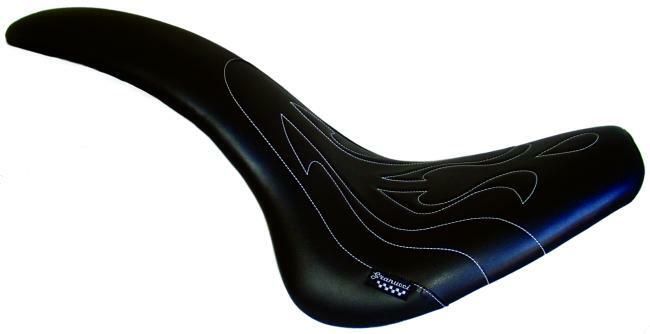 Although these are low profile seats, the seat base design is thick enough to totally support the rider. The outer upholstery is a rugged synthetic leather, fully waterproof, and will not crack or fade. The inner gel and foam filling is specially designed to adapt to the riders contour giving excellent support and comfort. All metallic details are applied using durable epoxy paint, and last but not least, the seat is stitched perfectly with tough, wearproof, weatherproof nylon thread. If you want a saddle that turns heads, you'll love Granucci seats!.